If your healthcare provider collected a specimen from you that was sent to Trumbull Laboratories and Pathology Group of the MidSouth (PGM), the following information will give you an overview of the services we provide, services for which we will file insurance and/or bill you. Trumbull Laboratories employs skilled technicians who process your specimen with expertise and quality. Once the specimen is delivered to our Memphis facility, our highly specialized personnel use sophisticated equipment in order to reduce the specimen onto a glass slide. This process is known as the technical component of Anatomic Pathology. The lab will file a claim with your insurance company and/or send you a bill for this part of the service. If you have insurance we will file claims with your insurance carrier and after they have responded we will bill for the remaining balances. Self-pay patients will be direct billed. If you have any questions regarding your bill, please see our contact page for information on how to call us. Please be sure to call our billing office rather than your provider's office because they do not have access to your Trumbull and PGM accounts. Who are the Pathologists and what is their role? Pathologists are medical doctors who have specialized in the interpretation and diagnosis of diseases in tissues and body fluids. They typically undergo 5 - 7 years of additional training after medical school. 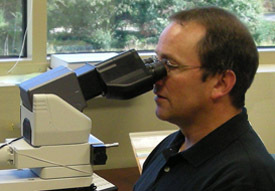 Pathology Group of the MidSouth has provided superior pathology services to the national health care market since 1947. Our fourteen pathologists and one internal medicine doctor are Board Certified and have obtained special expertise in 21 sub-speciality areas, essentially covering the entire spectrum of pathology services. We appreciate the opportunity to serve you by working with your healthcare provider for your good health.